Be a JaffaQuest cadet. Read the tourist’s guide to Datlof. Snort at rotten jokes and insider secrets. See how the Yogkings roll. 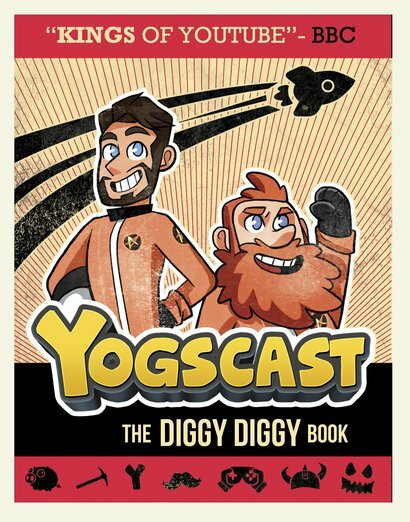 Hurray: it’s the FIRST EVER BOOK from the maestros of very silly gaming. Stuffed with: colour artwork, funny cartoons and other great stuff. YogsLab secrets. YogsTowers insider facts. Appalling humour. Excuses to munch on tasty jaffa cakes. Plus: the secrets of how they made all those really funny vids. Which they are obviously doing rather well, since they have over 20 million YouTube subscribers and 2.7 billion lifetime views in all. Not bad.